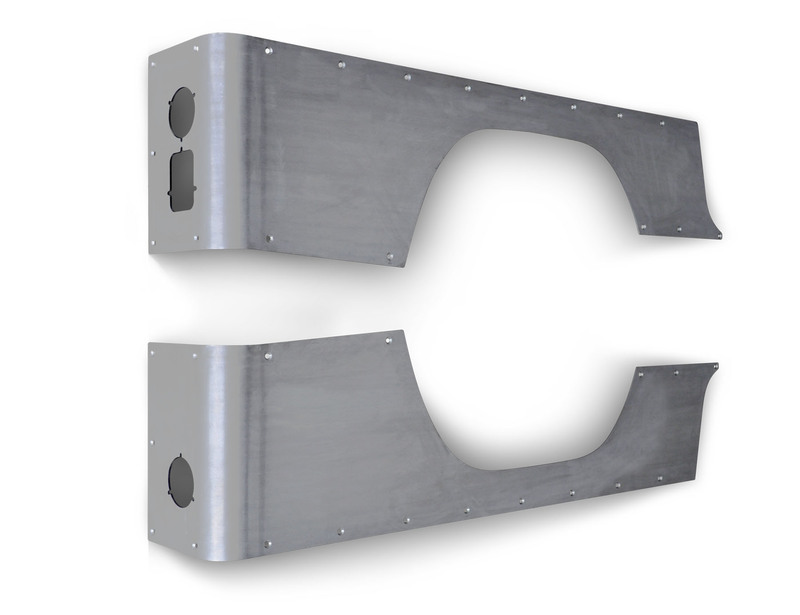 CJ-8 Crusher Corners - Standard (Steel)for Jeep Scrambler CJ8 1981-1985 Poison Spyder Crusher Corners are built for the off-road enthusiast who likes to play in the Big rocks. Crusher Corners are a key component in avoiding body damage to your Jeep. Choose from our Standard, Stock or Comp Cut or Modified Crusher Corners to fit your crawler unique needs. Poison Spyder Crusher Corners are laser cut from high strength 3/16 inch plate steel then careFully roll-formed for a perfect fit to your Jeep body lines. All of the bolt holes are countersunk, and the supplied stainless steel flat head cap screws yield a smooth, flat surface to slide over rocks. Stock Crusher Corners include the factory wheel and fuel filler opening, plus mounting holes for all factory equipment, including factory flares, tail light, tire carrier (if applicable), license plate frame, etc. Crusher Corners, when used in conjunction with Poison Spyder Rocker Knockers or Ricochet Rockers and front DeFenders give your Jeep an impenetrable defense against rock damage.